New Brunswick, N.J. – Aiming to further propel scientific discovery as well as augment and expand comprehensive cancer services for patients through collaborative efforts with Rutgers and RWJBarnabas Health, Steven K. Libutti, MD, FACS, has been named as the new Director of Rutgers Cancer Institute of New Jersey and will serve as Vice Chancellor for Cancer Programs for Rutgers Biomedical and Health Sciences at Rutgers University. When he takes on his new roles in early 2017, Dr. Libutti will be the third permanent director in the 25-year history of Rutgers Cancer Institute of New Jersey and will take over for Bruce G. Haffty, MD, who has been serving as interim director and will continue his role as Chair of Radiation Oncology. 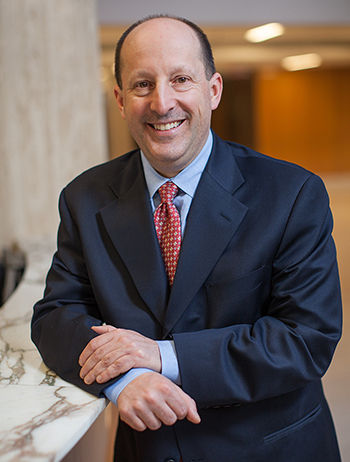 In addition to his leadership roles within Rutgers University, Libutti also will serve as Senior Vice President of Oncology Services for RWJBarnabas Health, further strengthening the university’s partnership with the healthcare system. Libutti, currently serves as Director for the Montefiore Einstein Center for Cancer Care in New York City and is Professor and Vice Chairman of the Department of Surgery and Professor in the Department of Genetics at Albert Einstein College of Medicine and Montefiore Health System. A surgical oncologist, Libutti is an internationally known expert in endocrine surgery and the management of neuroendocrine tumors. He is the immediate Past President of the American Association of Endocrine Surgeons. His clinical practice focuses on gastrointestinal malignancies including cancers of the liver and pancreas. The recipient of funding from the National Cancer Institute (NCI) for the past 20 years, Libutti is also a researcher whose work focuses on developing novel cancer therapies through an understanding of the tumor microenvironment and blood vessel formation in tumors. “Through his vast leadership and oncology expertise, Dr. Libutti will implement a unique vision to position Rutgers Cancer Institute of New Jersey as one of the top National Cancer Institute-designated Comprehensive Cancer Centers in the country as well as expand its impact throughout the RWJBarnabas Health System and the state. We look forward to this new chapter in the history of Rutgers Cancer Institute of New Jersey, and together we will make an exceptional program even better,” notes Rutgers Biomedical and Health Sciences Chancellor and Executive Vice President for Health Affairs Brian L. Strom, MD, MPH. “I am honored to have been chosen to lead Rutgers Cancer Institute of New Jersey during this pivotal time in its history. Working closely with my colleagues at Rutgers University, RWJBarnabas Health and community physicians, it will be my privilege to further advance the mission of Rutgers Cancer Institute and Rutgers Biomedical Health Sciences to enhance and expand oncology treatment services for patients,” notes Libutti. “As the state’s cancer center, it is part of our mission to advance the understanding of the inner workings of cancer as it is a disease that impacts so many. Cooperative efforts between internationally recognized scientists at Rutgers Cancer Institute of New Jersey, industry, academia and other collaborators will help us further accomplish this goal. I look forward to helping spur continued growth in all of these areas in order to further solidify our programs and partnerships as some of the best in the nation, and to improve access and care for our patients,” adds Libutti, who also will have an appointment as a Professor of Surgery at Rutgers Robert Wood Johnson Medical School. A graduate of Harvard College, Libutti received his MD from the Columbia University College of Physicians and Surgeons. Following his residency in surgery, he completed a fellowship in Surgical Oncology and Endocrine Surgery in the Surgery Branch of the NCI and was ultimately a tenured Senior Investigator and Chief of the Tumor Angiogenesis Section in the Surgery Branch, NCI. The author of more than 270 peer reviewed journal articles, Libutti holds seven U.S. patents, and serves as Editor-in-Chief of Cancer Gene Therapy. He is the recipient of both NCI and National Institutes of Health Director’s Awards and has been recognized as a top doctor and top cancer doctor by Castle Connelly, as well as one of the best doctors in New York by New York Magazine.